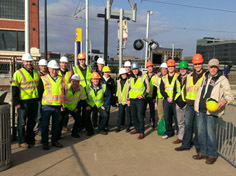 As the clouds parted after a long week of rain and cold, 23 APWA-MN Chapter members, including seven student chapter members from the University of Minnesota, came together May 2 for a tour of the soon to be open Target Field Station and Twins game. The tour was hosted by SEH, Knutson Construction, and The Interchange Project Office, IPO, and led by Justin Gese, SEH; Rob Bremer, KC; and Shelley Miller, IPO. Many civil, environmental, and architectural features were on display at Target Field Station. Among the highlights were the green roofs on the adjacent office building, the surface water collection/reuse system, a beautiful seating area capable of accommodating a band for concerts, and, of cours, the new interchange where future Twin Cities-area light rail will expand. Target Field Station, a project of Hennepin County, the Hennepin County Regional Railroad Authority (HCRRA) and the Hennepin County Housing and Redevelopment Authority, is located next to Target Field, connected to the North Loop neighborhood and adjacent to the historic Ford Center and Hennepin Energy Recovery Center (HERC). Opening in 2014, Target Field Station will be a central, multi-modal transportation hub and community gathering space in downtown Minneapolis and serve as a gateway to the North Loop and surrounding neighborhoods and amenities. This unique destination will connect communities by linking the region’s growing commuter and light rail transit network, and miles of bike and walking trails. 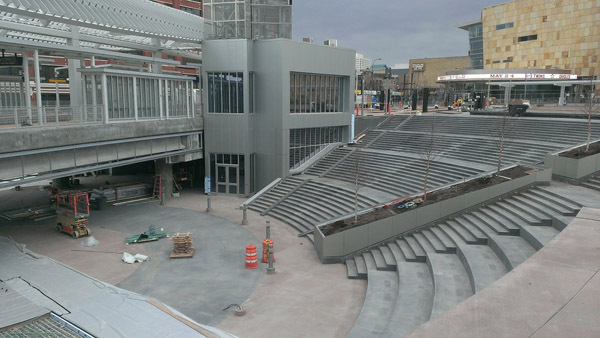 Near Target Field Station, visitors will access daily bus operations that connect the Twin Cities metropolitan area.